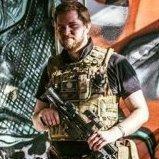 Need a hand sourcing some mags for one of my airsoft society members. The left one has WA GSHK stamped on it, so I take it that's a WA, in which case it's basically a lost cause. But with the one on the right being plastic is interesting as Im sure WE hicapas are full metal- then again it could just be another clone? I'm pretty sure tm's have a 'cut out' for the bb's down the front that widens at the bottom instead of the straight profile shown here. Yeah, I ought to have clarified that the left mags are for the right gun. I just made the assumption before. But yeah, I thought WE and WA but had the same thoughts regarding plastic. As for TM having the wider opening for ease of loading. A lot of people say that their P226 mags do that, but the ones I have definitely don't. Though you could be right about the 1911 variants. Are all hi-capa mags by WE interchangeable? Or do the smaller hi-capas take different size mags etc? But we're fairly sure it'll take a WE hi-capa mag of standard, M1911y size? At least we're getting somewhere. Cheers.